The adoption of the euro as Europe’s single currency made commerce on the continent much easier, but it didn’t do any favors for businesses or individuals who do business with European companies. Although receiving a check paid in euros instead of dollars provides a wrinkle in the check depositing process – mostly with large waiting periods – most banks allow account holders to deposit foreign checks drawn for an amount in euros instead of dollars. Banks’ policies on foreign-account checks vary, however, so consult your bank for its policies. Take the check to a branch. 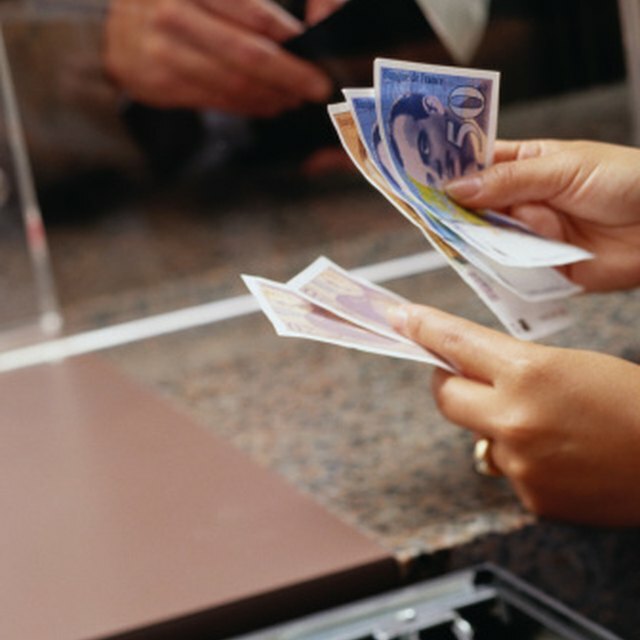 Because deposits of a check in euros must involve foreign exchange rates and currencies most ATMs don’t handle, you need to work with a teller for your deposit. Compute the value of the check in U.S. dollars from its euro value using a foreign-exchange tool online or using exchange rates your bank provides. Depending on when your bank clears the check and credits you account, the actual value of the check may be different, so use this figure only as a guideline for the value of the deposit. Sign your bank’s foreign deposit agreement, if necessary. These agreements typically authorize your bank to hold the funds separate from your account until the foreign check clears. This process may take as little as five days for a check drawn from a Canadian bank, to six weeks to eight weeks for other countries. Fill out the deposit slip provided by your bank. Depending on your bank’s policies, this may be a deposit slip geared exclusively for depositing euros into an account, or it may be a deposit slip based in dollars on the exchange rate at the time you deposit the check. Wait for the check to clear before you spend the funds it transfers. Your bank will send the check to a correspondent bank in the country in which the account is located, which will then transfer it to a local European bank branch. The European bank will transfer the check to the bank from which the check was originally drawn. Each step may require several days. To avoid the hassles of depositing a check written in euros, ask the payee to provide payment through a wire transfer or a cashier’s check from a foreign bank. While banks charge fees for these services, you’ll have immediate access to the funds when they reach your account instead of waiting for the check to clear. To avoid the hassles of depositing a check written in euros, ask the payee to provide payment through a wire transfer or a cashier's check from a foreign bank. While banks charge fees for these services, you'll have immediate access to the funds when they reach your account instead of waiting for the check to clear.